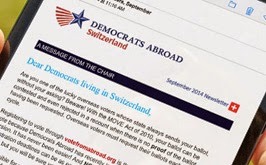 Democrats Abroad Switzerland, in accordance with its bylaws, will elect its new Executive Committee on March 23, 2013 at its Annual General Meeting. * According to Democratic Party Rules the Chair and Vice Chair need to be balanced between a man and a woman. Members interested in seeking election to a position or in nominating a candidate should submit a nominations form via email to the Elections Committee no later than February 16, 2013.